RICHARD NIXON SAID HE WANTED HIS administration to be "the best chronicled in history. " But when Alexander Butterfield disclosed the existence of a voice-activated taping system to a Senate committee in July 1973, Nixon's white House and its recordings quickly became the most infamous in American history. Only 60 hours were actually made public in the 1970s. Many thousands of hours remained secret and in Nixon's hands, and he fought fiercely to keep them that way right up to his death. Finally, thanks to a lawsuit brought by historian Stanley I. Kutler with the advocacy group public Citizen, a landmark 1996 settlement with the Nixon estate and the National Archives is bringing over 3, 000 hours of tapes to light. Packed with revelations, Abuse of Power offers a spellbinding portrait of raw and a Shakespearean depiction of a king and his court. Now, in this dramatic reconstruction of the tapes, the personalities of Haldeman, Ehrlichman, Colson, Haig, Kissinger, and Dean are vividly captured in their own words. 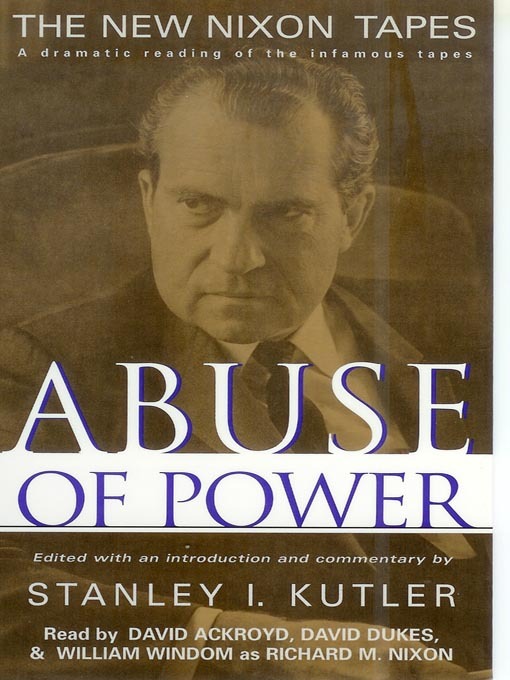 Finally, the full story of Nixon's downfall can be told.